One deck, two deck, red deck, blue deck, Fun Deck, Big Deck? What's a Big Deck? Most of my Webber Fun Decks from Super Duper Publications fit well into my organized drawers or even on the deck parking garage I got from Super Duper a little while back, but not this one! This is the case where big is really better! With a big, clear, real-life photo on the front and a paragraph with questions on the back, your students will be able to understand real-life application of inferencing skills! Continue reading for my review of the Webber Inferencing Big Deck. Associations (These items belong to...) - Shows an image which requires the client to state what type of person or occupation is associated with the items shown (who uses the items shown). Identify the Setting (Where is this?) - Shows an image of a setting which requires the client to state what/where the setting is and answer other questions about the setting. Part to Whole (What is it?) - Shows a part of an object and asks the client to identify what the object is from the part. Predicting (What happens next?) - Show an image of an event/action taking place and requires the client to predict what will happen following the time the picture was taken. What Happened? - Shows a picture of an event/action taking place and requires the client to predict what happened in the picture. Next, show the client the image on the front of the card and read the short story (approx. 3 sentences). Then, ask the six follow-up questions. The first question on each card can technically be read without reading the paragraph, and in some cases should be read prior to the paragraph, as it is an inference based on the image only. You can also choose to practice these cards using the game ideas. Act out the cards, discuss emotions from the pictures, play eye spy, and more with these great ideas put together by the authors of this deck! If you need a hint for some of the answers for the inference cards, check out the Contents cards for each topic. All photos are real-life photos of items, animals, settings, and/or people which helps the client connect inferencing skills more with their own lives. You can just use the photo as a cue and state the first question on the back of the card, you can read the paragraph and ask the follow-up questions, or do both depending on what you want to focus on with each client. The cards are big which means you won't lose them as easily and they can fit a paragraph and questions on each card. The size and quality of the photo on the front of the card is also great for those who have vision impairments. 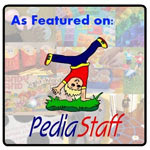 Each topic has a larger, color-coded topic card in front to organize each set within the box. It would be great to have a card in the front with inferencing tips for my clients to keep out as a prompt/cue for them. I could then put it out for those starting to work on inferences or put it away for those who do not need the cue. Of course, I always would love to have more topics/cards either in an expansion or the next edition! Articulation/Fluency/Voice - Have student(s) read the game cards aloud using their best speech sounds, fluency strategies, or vocal strategies. Associations - Use the "Associations" card set to discuss which occupation goes with the items in each image. Auditory Processing/Comprehension - Read the paragraph aloud and have your client answer the six questions from the back of the card. Describing - Play the "Eye Spy...Details" game on the Game Ideas card or describe what you see in a picture and have students guess which picture the person is describing. Emotions - Play the "Get Emotional" on the Game Ideas card and have students describe the emotions in which the people or animals are feeling in the images on the cards. Expressive Language - Have your client discuss what they see in the photo or state/write a sentence or paragraph about the photo. Following Directions - Have your client point to different objects or people in the pictures. Inferencing - The entire big deck focuses on inferencing in many different ways. Problem Solving - Use some of the "What Happened?" cards to discuss problems that can be inferred from the pictures and how to solve them. Receptive Language - This deck of cards has clients identify what is in the pictures, understand and use vocabulary related to the pictures, make inferences about the pictures, and understand how different items in the pictures can be used or whom they are associated with. Social Skills - Use some of the "What Happened?" cards to discuss problems that can be inferred from the pictures and how to solve them, how different animals/people are feeling, and ask questions about your clients opinions about different situations. Vocabulary - Many of the different cards have an item or setting on them in which can be discussed with further description. Use the "Part to Whole" cards to discuss parts of an item. Use the "Identify the Setting" cards to discuss which animals live in the setting, what climate is in that area, what kind of vegetation grows there, etc. Writing - Have students play the "Write it Down" or "Extra! Extra!" games which both involve writing given the photo as a prompt/story starter. 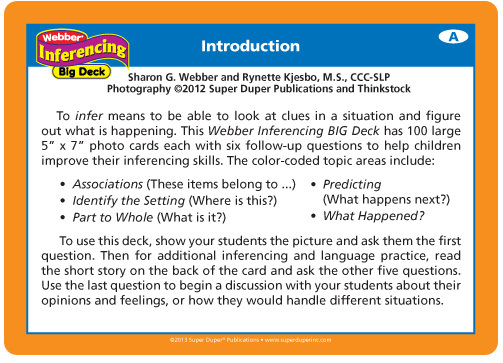 The Webber Inferencing Big Deck is available from Super Duper Publications for $24.95. 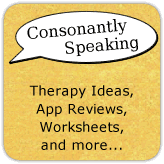 The author of Consonantly Speaking received the Webber Inferencing Big Deck to review from Super Duper Publications. No other form of compensation was received.